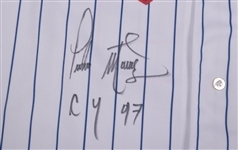 Lot Detail - Pedro Martinez's 1997 Montreal Expos Signed Game-Worn Jersey with "CY 97" Annotation - First Cy Young Award Season! Pedro Martinez's 1997 Montreal Expos Signed Game-Worn Jersey with "CY 97" Annotation - First Cy Young Award Season! Posting a slender 1.90 ERA along with 305 strikeouts, mound ace Pedro Martinez was the obvious choice for the 1997 Cy Young Award, with this his first of three. 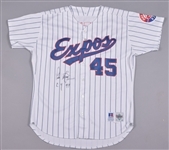 We have a signed Montreal Expos jersey that was worn by Martinez during his Cy Young-winning season of 1997. A Russell swatch with “46” sizing sits over the front lower left, with “46” handwritten within the collar. “Expos” appears across the chest in stylish script, fully administered in tackle twill, with “45” over verso along with the Jackie Robinson 50th anniversary crest over the right sleeve. With just a few marks over the lower front, the jersey remains in wonderful condition. Pedro has signed over the right side beneath the team crest in black marker, adding the desirable “CY 97” inscription. 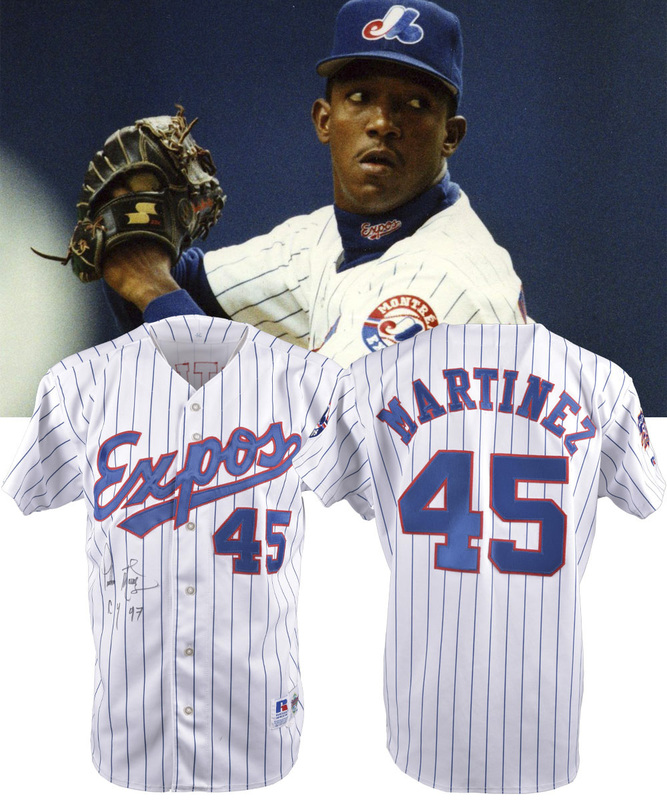 Martinez entered the Baseball Hall of Fame as a first ballot inductee, in 2015.